Lately, Microsoft has been updating users computers automatically overnight. You leave the office or home at night and come back in the morning only to find that your computer looks nothing like it did. 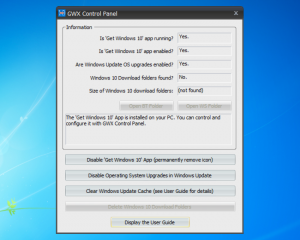 Windows 7 has been “upgraded” to Windows 10 automatically. There are a few technical articles regarding a way to prevent this from occurring, but if your not a Microsoft Guru, it might as well be written in sand script. Fortunately, a small company named Ultimate Outsider that developed a control panel to delete the upgrade files, and prevent Windows 10 from installing. This small, free install will save you from the horror of waking up to a new, unfamiliar operating system.